Ceiling Sound Speaker 3 " 6 watts. TC 630DX : Speakers with LMT, 6, 8 ohms, 60 watts, 100-20KHz. TC 515 : Speakers with LMT, 5, 40 watts, 100-20KHz. Temples, Auditoriums, Offices, Home, Cinema, Bank, Restaurants, Pizza Joints, Fast Food Centres, Departmental Stores. - Speaker size = 5.25"
- Frequency range = 200 Hz- 12 kHzs. When The Situation happens when you require Common announcing to your employees, or you want to announce in particular place in the premesis. Some times the requirement arrives of Hi-Tech Conference System with Audio and Video Facility. On other side the situation happens of emergency for evacuation . The AudioStar Ceiling Speakers are designed for overhead audio applications for music and voice in small and large classrooms, conference rooms, and boardrooms. Each speaker has been designed to meet the needs of specific application requirements. High quality flush mount ceiling speaker. 6 Full Range Speaker, 6W/100V. Aesthetically designed plastic grille and easy mounting with spring loaded clamps. Kindly refer pdf file for details. Safety Agency Ratings: UL 1480. Safe for use in air handling spaces per UL 2043. 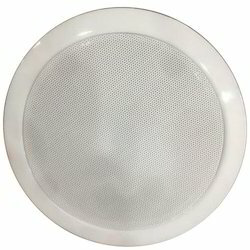 The 6 Watt Metal Grill Ceiling Speaker (LBD 0606/10) is a general purpose, 6 W, cost effective ceiling loudspeaker. The loudspeaker can be used for reproducing music as well as speech. The speaker assembly consists of a single-piece, 6Wdual cone loudspeaker and frame, with a 100 V, matching transformer mounted on the back.